Last year was one of change in the world of CD-i especially without the availability of 'The World of CD-i' and even the absence of 'The Black Moon Project' for the most part. It went a little quiet over the months and on top of that Interactive Dreams took a nap around October/November. Fortunately we also welcomed a few new active CD-i members including 'Shroo-man' and 'KingArthur' who brought back the enthusiasm to more people. We started the year 2008 when Charles Doty revealed his plans for a Mode 7 style CD-i racer but we haven't heard from him since. Oldergames ended business in January which was bad news to the CD-i homebrew scene. 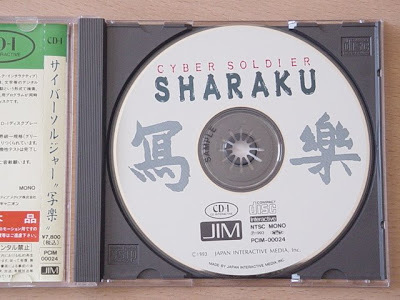 The rest of the year was very quiet as stated above but in December the best news was all the information Shroo-man provided us of the japanese exclusive CD-i game "Cyber Soldier Sharaku" (more here soon). So that's it. I'm happy to say next year we'll be here as always to complete Interactive Dreams with all information available although you never know how things go. 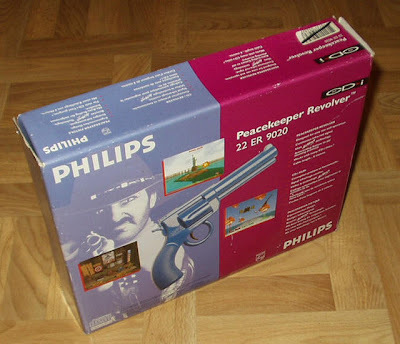 I would like to thank you all for your support and enthusiasm for the Philips CD-i system. We'll together make sure to keep CD-i alive in 2009. What will be ahead of us? Updates on CD-i Emulator? Homebrew CD-i programming by Charles Doty? More japanese CD-i games? Discworld CD-i? One thing is for sure: There are numerous things keeping the format interesting. Happy Christmas! Never thought Japan would have japan only CD-i games, moreover Golgo 13 looked like a hoax to me because I've never seen a real copy! 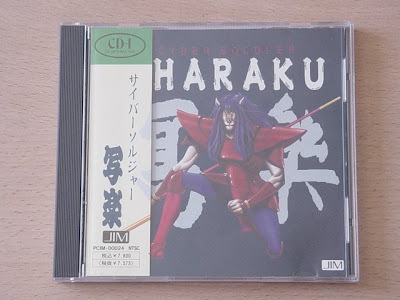 But recently I saw a copy of the unknown Cyber Soldier Sharaku anime game on CD-i which you can see pictures of here. First, the covers. Thanks to Shroo-man for the media! A review follows soon! Some hints to more Golden Oldies games than the two titles that were released by "The CD-i Hacking Factory" in 1997, as it was copyrighted on the disc. I suspect this is SPC Vision humour!! Perhaps they resented doing a conversion of existing Intellectual Property. "Golden Oldies. I think I did the graphics for all of the games except for the Centipede clone which was done by someone else. Nothing I am proud of, I must confess. They were made in such a hurry that I really had no time to be as thorough as I would've liked. I think I had to spend about 2 days per game to do the graphics on. They were really stressed projects for me. I actually made the graphics for more Golden Oldies type of games which never made it to disc, unfortunately. I reckon the graphics I did for a Scramble clone was quite okay considering the little amount of time spent, but it was put on ice, apparently." ""The Golden Oldies series began as a "time filler" project; it was unclear if the games would ever be released. When there were a few oldies sort of working, there was a commercial opportunity to release. They were quickly finished, some music was added and a simple loader menu was put in front of them; then they were released into the world. This was near the end of game development at SPC, There must be an unfinished "memory" game somewhere, and there was 'Pool'." Volume one of the Golden Oldies series contained arcade conversions of Defender and Space Invaders renamed in this package as Guardian and Invaders respectively. 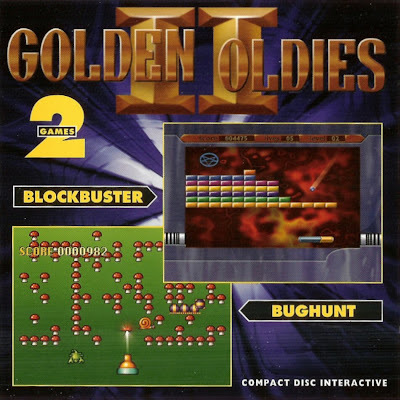 Volume two of the Golden Oldies series contained arcade conversions of Super Breakout and Centipede renamed in this package as Blockbuster and Bughunt respectively. The retail package and even the disc itself contained no information concerning the producer or developer, if it wasn't for a few hints left by the art and programmers then this would have remained a mystery. 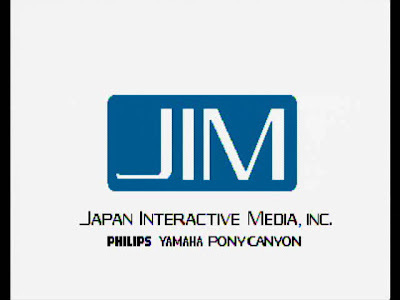 First clue was the title screen containing a partial logo of The Vision Factory, second clue came from the unique animations and typical styles used by this company in their games. 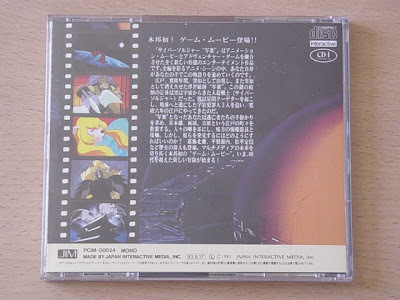 Finally from the disc itself and probably a joke from the programmers responsible for this game the producer appears as "The CD-i Hacking Factory"! Further to this and only noticeable from high quality screenshots taken directly from the video source of Guardians Highscore Table a programmer Stefan Posthuman and Artist Nik Malmqvist are credited. The former Stefan Posthuman we can safely assume is Stefan Posthuma credited on many SPC Vision games, again with typical SPC humour! The later Nik Malmqvist is of course Niklas Malmqvist credited with the artwork from the early days of Alien Gate through The Apprentice and was also involved in some aspects of Lucky Luke. 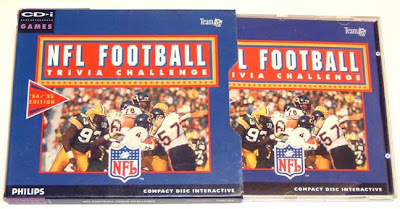 The classic board game from Hasbro was licensed by Philips Media and converted to CD-i by Capitol Multimedia inc, better known as CapDisc. This game was a USA exclusive release although various European CD-i distributors did import the game, especially true of UK based retailers. The year is 1942, and it's time to wage war. However, this time, history is in your hands. Play as 1 or more of the 5 key powers of World War 2 and atempt to lead your country(s) to victory. Will the Axis powers conquer the world? Will the Allied countries withstand the assualt and push forward to win? It's all up to you! As far as graphics go, its not going to win any awards. It's basically a flat map with colors for each country denoting which of the super powers occupies them, and when you zoom in, it shows little tanks, planes & such to let you know what is there. However, when a country is highlighted in regular mode, it shows the military data in the column at the upper right-hand side of the screen. There really is no soundtrack to speak of, except for the sounds of war & industrial production provided by the video clips. This is a plus, since most strategy games have music that gets on your nerves anyway. So just turn down the sound & crank up your own tunes. Control is where this game gets somewhat annoying. While it's icon driven menu system is nice, the constant loading of the video clips makes the controler skip occasionally, and makes use of the CD-i mouse (which would be ideal for any strategy game) almost impossible. All in all though, this game is extremely fun for the strategy minded & WW II buffs. However, if you're looking for fast paced action & shooting, I suggest you look elsewhere. by: rdjnl - Do you agree? A year ago we told you about a new CD-i website simply named the "CD-i Shop". Pleasantly surprising this was a very complete website offering a full catalogue of software titles and hardware peripherals at very low prices. 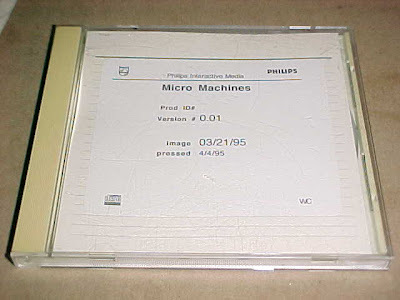 The arrival of a new dutch CD-i initiative always gave me a warm heart, and it's another loss now I hear that the CD-i Shop is completely sold out. There's no specific CD-i place left for you to buy CD-i stuff, so we're heading back to ebay and Marktplaats for the best offerings. The front port is connected via the so-called "slave" processor and supports only pointing devices (these are all input-only); the back port is connected to the main processor and supports bidirectional i/o and hence more devices (is is essentially a "normal" serial port and can be used as such by CD-i software). Players supporting a splitter combine the two ports in a single connector and usually have a third port supporting only pointing devices. CD-i software is supposed to support pointing devices on all ports (this was a publishing requirement by Philips Media) but it wouldn't surprise me if some software out there doesn't do this correctly. "RS: Mass Media, based in Moorpark, California, is the newest addition to the THQ Studio System. Previously they created the CDi Tetris game and many of the team members have a passion for Tetris and the puzzle genre. They have worked on a wide range of products in the past and are currently focused on next-gen development. We’re very excited to have them as part of the THQ Studio System, working exclusively on THQ titles now. 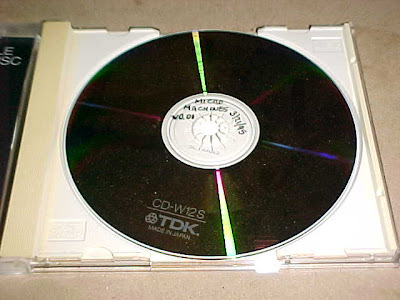 Mass Media developed Tetris for the Compact Disc Interactive, known as CDi, the first CD-based entertainment system platform back toward the dawn of time. We’ve also accumulated a few hundred mini-games in our portfolio over the years, many of which were puzzle-based, so our puzzle roots run very deep. " A few weeks back the news arrived us that Mass Media, as part of THQ, is on the list to be closed by THQ in order to reduce costs. That would mean the end of one of the very few software companies who survived CD-i. With 2008 soon be over I feel like sharing some history views on the CD-I websites in the past ten years. 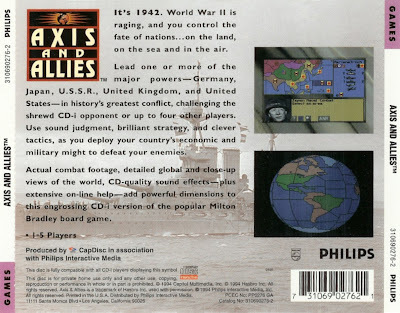 It’s roughly been ten years since Philips pulled the plugs out of all CD-I events and thankfully the rise of the internet caused a small CD-I scene to stay alive. With only a handful of people maintaining the online CD-I world it’s a miracle after ten years the format hasn’t been forgotten. And honestly, in the past months it’s been new people who share their crave for CD-I instead of the old crew. However, we used to have a different forum at CD-I Heaven, and I did my best to retrieve any contact info of the owner but as the place was run on a free hosting place, after a while it disappeared. 2001 was a special year when Devin Shockwell started the Black Moon Project, the oldest CD-I website that’s still alive, although it has its vacations that can take up a year or so. Those were the days when Gir Draxa put up his CD-I Collective at Geocities to share his CD-I reviews on games and hardware. A few years later he transferred the content to a more stable server, however that version is offline nowadays. The old free Geocities version is still available. The biggest stir came in 2003 when Omegalfa started a French CD-I website, Le Monde du CD-i. Along with it the dutch Terratron put his CD-I efforts in cdi.eigenstart.nl and later at www.terratron.nl, but none of that is here anymore. Even Le Monde du CD-I is offline, mainly because all the people of interest are not here at the CD-I front anymore, so it shove to the background and due to some software risks it went offline. In 2004 Devin started the Cdinteractive Network, which was meant a a hosting place for new CD-I websites, but unfortunately it hasn’t been used a lot. The only big thing going on is the continuation of one of the important CD-I archives: The new International CD-I Association. More of interest came in 2007 when member rdjnl experimented with cdi.isgreat.org, which is somewhat dormant right now. I have no idea if he has any further plans for the future. Some new stuff may come from member XCLTempest, but until now we have yet to wait and see. Interactive Dreams launched in 2005 as The Black Moon Monthly where I started with one article every month. After one year I felt the need to create a full blog out of it and that’s how the current site evolved. All the articles of the past years are in our archive, as well as the articles of Le Monde du CD-I, and CD-I Collective, Terratron’s CD-I repair guide and The Black Moon Project. So thankfully, most of the articles are in our vault, or will be in the future. 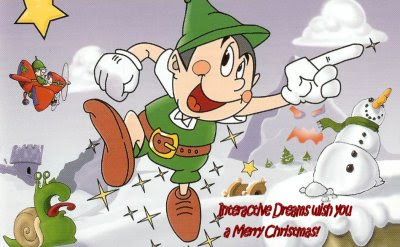 With this in mind Interactive Dreams has created the headquarters of all online info gathered by many CD-I fans, of which I hope some will return to boost the interest in CD-I for the coming years. With that, you’ve found all available CD-I related websites, of which only a handful are still available and even a lesser amount is active. Although I’ve been around since the very beginning, the old days brake up my memory so the picture is far from complete. I’d like you to join me in sharing some history stories about the CD-I websites in the past years, please leave yours below! Considering the low activity in the world of cd-I I decided to take a little break and focus on my new project at idvga (That's short for Interactive Dreams: Videogames) - I'm putting my hobby of writing into a dutch games blog for the coming time. This is by no means the end of this CD-I blog, although there's currently no news to post, no event to happen and all relevant CD-I sites are either dormant or offline. We'll be back when interesting news rises like new CD-I Emulator developments, new interviews from The Black Moon Project or a new CD-I homebrew release maybe. CD-I will revive at sometime, but it may take a while before our CD-I colleagues have the time to put the effort in this great underestimated format. See you soon! The website archive is full of reviews, making-of articles and a lot of visual material, so what's left to keep the site alive is complete it with all known cheat codes for CD-i games. It's a part relatively unknown to the scene, and it may pull you over to try those games again where you're always killed by the same monster every time again. Lucky Luke was one of my favourite CD-i games showing of some very cool graphics on CD-i. If you want to play God and be able to hunt down the latest Dalton you can pause the game (by pressing [down]+[button 1/2]) and press: [up], [right], [down], [left], [down]. Now you'll be able to select the stage, unlimited health, unlimited lives and unlimited ammunition. On to the next game! When we were looking for Japanese CD-i titles we never thought there were so many titles released with a true japanese cover! We never saw any pictures but last week CD-i member 'j_eits' discovered a link which shows a lot of them. Included is an original cover of the unknown Golgo 13, which looks like this was actually a released game. Also on the list is CD-i Mah-Jong, unfortunately without a cover scan. I've picked out the best ones but be sure to check out this link! These translations were all created by Philips Artspace, finally showing some 'evidence' thanks to these pictures! Thanks to j_eits for the link and gamest.com for the pictures!